Although it is now June we are still finding ourselves repairing boundary walls and fences caused by the devastating floods last December. Last week we finally got to one of the last remaining fences that had been destroyed by a landslide. 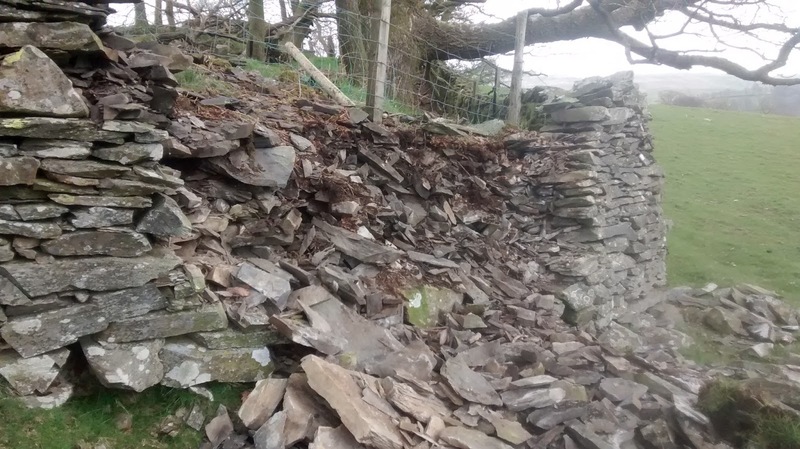 About 80 metres of fence had been completely destroyed and needed replacing, before the farmer could let his sheep back onto the fell. This was probably one of the last fences to be repaired because of its difficult location. It is situated half way up High Hartsop Dodd above Brothers Water. 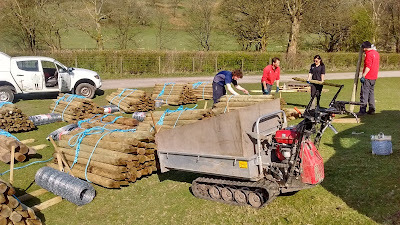 To repair the fence we needed: 40 posts, 4 strainers, 8 12ft rails, 2x 50m roles of wire, a post knocker, a bar, bucket of staples not to mention numerous hand tools. This would have taken us the best part of a week to get to site. We managed to get the materials to site in half a day. A special thanks has to go to our compatriots from Windermere who also came to lend a much needed hand. Once all the material was on site we could get on with the job at hand. It wasn’t going to be easy. The terrain was still very loose and wet from the landslide. The plan was to try and follow the old fence line where possible. Once we had located that we could start putting in the new posts. 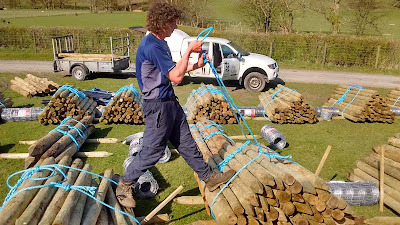 Some of the larger posts (the strainers) had to be strutted, to stop them moving when we put the tension onto the wire. Chiseling out the wood for the strut. Not a bad view. Once all the posts were in place the wire could be attached and the fence once again could become stock proof. They’re on the wane now, those carpets of frosted blue, melting back into the woodland floor as the mercury rises and the canopy closes over. Yet for an all-too-brief window every spring, bluebells bring woods all over Britain bursting into life. To many these azure seas of flowers are as emblematic of the returning sun and lengthening days as the call of cuckoos or the sight of swallows. It’s little wonder that our native hyacinthoides non-scripta is amongst the favourite of the nation’s wildflowers. This charismatic, ‘eloquent’ little flower is rich in folklore and history too, and perhaps because they are found in ‘ancient’ woodland, or perhaps because they contain poisonous glycoside compounds, bluebells have long been associated with fairies. Legend has it that the ‘bells’ were rung to summon fairies to gatherings deep in the woods, but should the ringing fall upon a human ear, alas death would soon come upon that unfortunate soul. A meeting place for fairies? To witness the spectacle of a bluebell wood in full bloom, whilst hopefully avoiding an untimely demise, there are few better places than here in the Lake District. Bluebells have a preference for oceanic climates, so the UK, and the west coast in particular, with our prevailing weather bringing mild and wet fronts off the Atlantic, creates the perfect growing conditions. In fact, so well suited are they to our climate that the UK is home to around half the world’s population of hyacinthoides non-scripta. Bluebells also grow best in undisturbed soil, in ground that has remained free from the plough or other intrusions for as long as possible. They tend to take a long time to become established in new habitat, yet this apparent torpidity also means that they can linger long after conditions have changed. Like organic archaeology, to come across an open field of bluebells is to bear witness to a changing landscape, a persisting footprint of a now-vanished habitat. They, along with a handful of other plants, are an indicator of ancient woodland. Ancient in this sense meaning pre- 1600 AD, before maps became widely available and woodland management became commonplace, though some may have lineage that traces all the way back to the most recent ice-age, 10,000 years ago. It’s a rare and shrinking habitat, covering just 2% of the UK’s land surface, though unfortunately it’s rarity often doesn’t equate to value, and many sites remain unprotected in law, at the mercy of human development and exploitation. Bluebells in open habitat are an indicator of ancient woodland. Bluebells themselves however, do enjoy a certain level of protection. Although not officially endangered, since 1998 it has been illegal to collect them for sale, and they are further safeguarded from intentional uprooting under the Wildlife and Countryside Act of 1981. The major threats to our native flowers however, come in rather more subtle guises than unscrupulous plant collectors. They first started to appear in the 1960’s, immigrants from Spain escaping from confinement in gardens and parks. Over the following decades increasing amounts of this modern-day Spanish armada has appeared in our woodlands. More robust, more adaptable, and more vigorous than UK bluebells, hyacinthoides hispanica will out-compete native flowers wherever they gain a foothold. To further cloud the picture the two species will readily interbreed, producing a hybridized variety with characteristics of both, and which could ultimately lead to the loss of the genetically distinct non-scripta species. Ominously, in a recent survey by the charity Plantlife, it was found that one in six bluebell woods contained either Spanish or hybrid bluebells alongside native UK plants. Recognising the three varieties of bluebell now encountered in the UK woodlands (image reproduced courtesy of Cumbria Wildlife.org). Yet it is it is a different threat which represents the most uncertain future for our beloved bluebells. Native seeds can and are being banked. Spanish invaders can to an extent be eradicated (though it is illegal to uproot any plant without landowner consent). A changing climate however, could see bluebell carpets disappear into memory as the ecological niche to which they are so superbly adapted is swallowed up by shifting patterns and seasons. If the trend for earlier springs continues, the advancing overhead canopy and competition from other plants on the woodland floor could close the window on bluebells forever. Could sights like this become a thing of the past? I for one hope not. I hope that the spectacle of a bluebell wood in full bloom, surely one of the most delightful and uplifting treasures of the British countryside, is around for many years to come. I hope that future generations can experience and wonder at their subtle majesty, and fill their own softened hearts with bliss as they do so. I'm sending a blog 'postcard' from the USA, about my recent adventures to the Grand Canyon Parashant National Monument and Lake Mead National Recreation Area (this is the first time they’ve offered shadow assignments at the World Ranger Congress). I’ve tried to pick out the highlights as there is so much I want to talk about! Andy Dutton (an Australian ranger from Queensland Parks and Wildlife Service) and I spent a week with key staff and rangers at Lake Mead National Recreation Area, the Grand Canyon Parashant National Monument and Pipe Springs National Monument as well as the awe-inspiring Zion National Park. We shared stories about our respective areas and learnt about issues facing each of these areas. The American protected area system is so different to the UK, many of these areas are owned by the federal government. It was a fantastic experience to compare how the three different countries approach the ranger profession. And my, do the Americans know how to make people feel welcome. 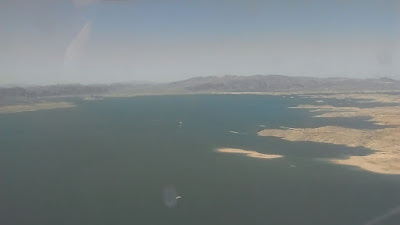 Lake Mead is a huge area outside Las Vegas (think a huge version of Windermere) popular with boaters, day trippers and those seeking a wilderness experience. The vastness of Lake Mead, where they're facing issues with historical lowering water levels. We also experienced the Colorado river in all it’s glory by taking a rafting trip below the Hoover Dam to see some of their visitor and resource management issues. Obviously enjoying the mid-30 degrees heat! Rafting down the Black Canyon, meeting local specialists including a meteorologist, the chief Law Enforcement ranger and a biologist. Ranger pilot Scott Taylor also took us between Boulder City (where we were based) to St George in a small plane. In between bouts of nausea (the updrafts were pretty intense) I took what seemed to be a million photos of the Grand Canyon en route. The scale of land they manage out here makes having a small plane an essential part of their role, particularly for law enforcement and fire management. As a contrast,we also saw the Grand Canyon from the Parashant (the flatter lands to the North of the main Grand Canyon that the tourists go to). It was great to spend time with their ecologist, their physical scientist, archaeologist and other rangers and to learn more about what it takes to manage this huge piece of land. And finally, imagine being a backcountry ranger and being given a government issued mountain bike to patrol around on? Often the roads in this part of the country are so difficult to navigate (particularly when it rains!) that this is the best way to get around (being a long distance runner also helps too, naturally). I am sure job applications from any of you fit and hardy souls would be welcome! From one extreme to another. Zion National Park has 4 million visitors a year. Most going to the main canyon, with concrete pavements and double buses getting visitors up to the main walking routes up the valley. It seems in order for everyone to be able to enjoy these special places such apparent extreme measures are necessary. One of the key things I’ve got from this experience is that as rangers we all face similar issues regardless of our location. However rangers in America have comparable powers to the police, have responsibility for fighting wilderness fires and play a key role in search and rescue. But then America is much much larger than the UK. Many thanks to my hosts at both Lake Mead and the Parashant. I look forward to showing them the delights of our wonderful Lake District in the future! I’m now at Estes Park in the Rocky Mountain National Park for the World Ranger Congress and it is quite a contrast to the very dry desert. High Lickbarrow Farm. Walling with a tree in mind. 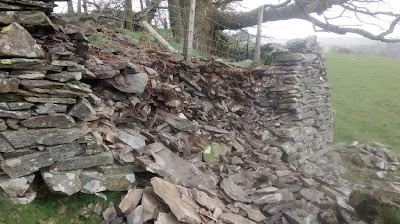 Recently we have been repairing roadside dry stone walls at High Lickbarrow Farm near Windermere. This particular gap proved to be the most challenging to rebuild. An oak tree, seen behind the mass of ivy, had grown up close to the wall subsequent to it being built. 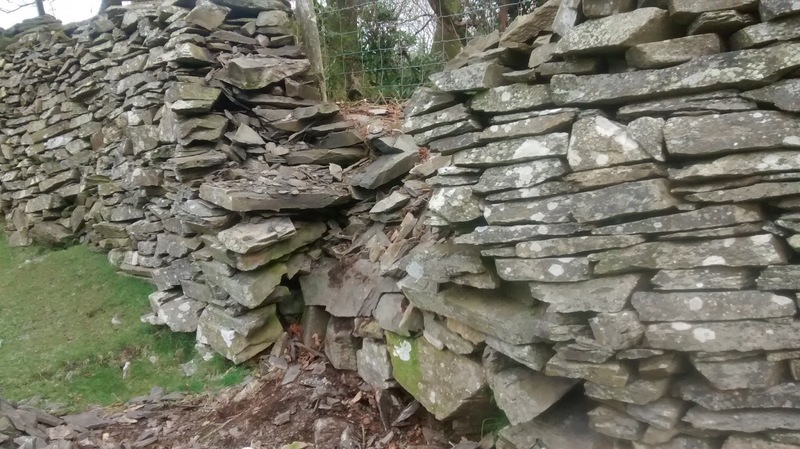 Over many years, as the tree grew, it gradually pushed the wall out of shape and it's root system caused further problems to the wall's foundations. With the wall stripped back it was now clear that a main root had grown through the full width of the wall. No doubt that this was the main cause of the wall's collapse. A technique we have used before is to bridge tree roots in walls; this allows roots room for further growth and helps to lessen their impact on the wall. The root has space around it after being bridged. The rocking motion set up by the root from the swaying of the tree should be less damaging to the wall. On the roadside the wall was rebuilt following the contours of the tree trunk allowing space for the tree to sway in windy weather... hopefully without affecting the wall. The wall is narrower at this point than is ideal but it is a compromise that will, we think, give the rebuilt wall a chance of staying intact over the long term. ...with a corresponding image of the wall from the roadside; this shows just how much the tree has encroached on the wall. It made the walling interesting to say the least. A bonus working at Lickbarrow was seeing the new arrivals to the Scoutbeck herd of Albion cattle. The calves are about two weeks old. Please check the blog for future posts on the Scoutbeck herd of Albion cattle at Lickbarrow. They are just naturals in front of a camera. Martin Wood...A Tale Of Two Walls. This is Martin Wood situated just above Troutbeck Village, close to the start of the track that leads to Wansfell. Within lurks some wonderful, largely intact stone work that presumably formed part of the boundary of an old walled garden that sadly fell into disuse a long time ago. The stones, in this image, were painstakingly shaped to allow the grand entrance to have an oblique angle of approximately twenty degrees...astonishing attention to detail. The walling as a whole is a credit to the stonemasons and dry stone wallers of yesteryear. This wall end, (again beautifully constructed), had a holly hedge meeting it to form part of the boundary, the old trees of which are to be seen in this image. The west facing wall is over fifteen feet tall. The buttresses were probably added later to give it some much needed support! Part of the old holly hedge. One of the quarries within the wood which supplied the stone for the walls. This is presumably the ruins of the old quarry hut situated close to the main quarry. A walled Garden with..not too bad a view of Windermere... looking south towards Belle Isle. ...Well I mean, just look at the state of it! ...we were able to dig out, reposition the foundation stones, and start rebuilding. Because the wall is well over six feet in height on the field side, most of the top stones were put in place on the wooded side where, as can be seen, there is a marked disparity between the two levels! Helicopter Lift at Troutbeck Park Farm. A large quantity of fencing materials required transporting onto difficult to access upland areas of the National Trust farm, Troutbeck Park Farm, including The Tongue and Yoke. A helicopter lift was deemed to be the most cost effective and efficient means of achieving this. British International Helicopters were contracted to do the work here, and elsewhere in The Lakes, by the National Trust in partnership with the Lake District National Park Authority. 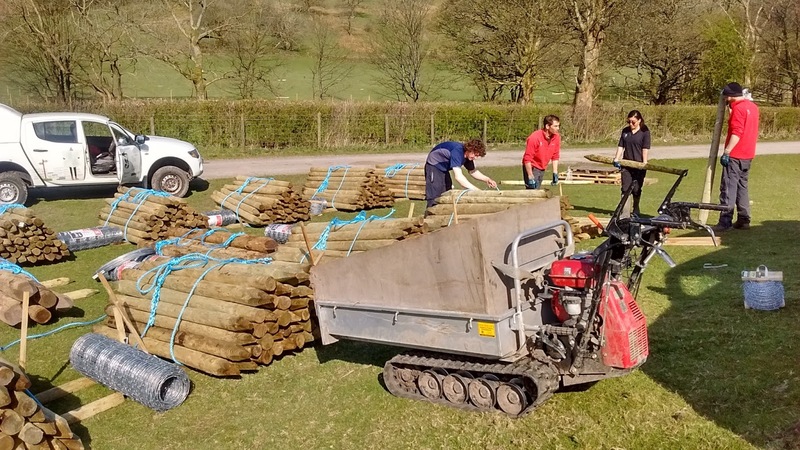 The fencing materials are needed to repair flood damaged boundaries and to stock proof certain areas from sheep; the aim here is to improve wood pasture land by a conservation grazing regime with limited numbers of cattle. Prior to the day of the lift, much preparation work was needed such as stacking the fence posts into bundles and roping them up. The stock netting and barb wire were put into one tonne bags. Quantities of fencing materials and even more 'bundles' higher up the slope. 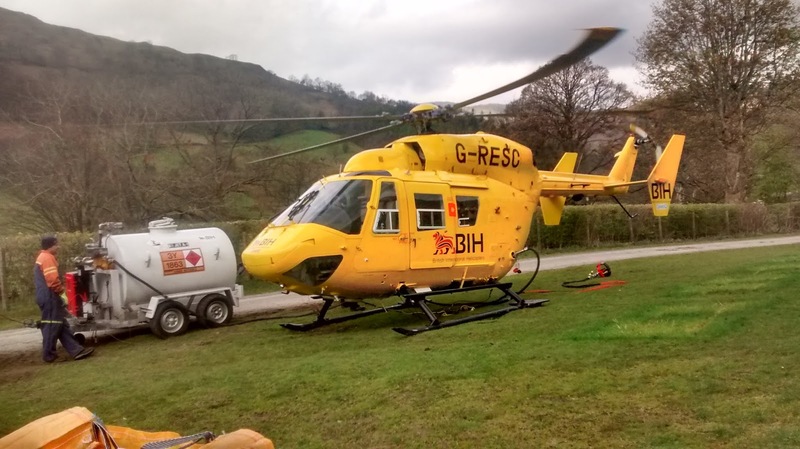 The British International Helicopters' BK 117 C1 G-RESC refuelling on the day of the 'lift'...May the fifth. The lift in progress...this helicopter has a lifting capacity of 1.2 tonnes. ...and an image at 25X zoom, approaching the drop zone. 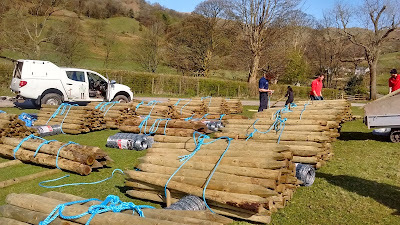 Another 100 posts on their way to The Tongue, the summit of which can be seen in the background. With special thanks to the pilot and ground crew of British International Helicopters. All the fencing materials were flown to their designated drop zones in less than half a day...Impressive!